​One of the most anticipated fights within the Asian boxing community will take place on July 27, as Yusaku Kuga defends his Japanese Super Bantamweight championship against Shingo Wake. Yusaku Kuga (16-2 / 11 KOs) is a star on the rise. Burst into the scene in 2010, while still 19 years old, he started massing up victories one after the other. In just 3 years, he was already facing much more experienced boxers than himself, like Yuki Iwasaki (11-4*), Koji Aoki (16-7*), Kojiro Takada (13-8*), knocking out every single one of them. With a record of 11-1-1 he entered his first major championship bout on December of 2015, facing former WBO International champion Yasutaka Ishimoto (26-8*) for the vacant Japanese Super Bantamweight title. Both men went to war and in the end, Ishimoto got a very close decision to win the match and the belt. That loss, only motivated Kuga even more to try and capture the gold. In 2016 he dispatched Thai fighter Sukpraserd Ponpitak (13-5*) and Philippino standout Jonathan Baat (32-7*) to earn another shot at the Japanese crown. The rematch between Kuga and Ishimoto was set on February of 2017. Most fans expected this to be another back and forth affair, but that wasn’t the case this time around. Kuga blasted the champion early in the first round, knocking him down, to the surprise of everyone in attendance. In the second, Ishimoto endured a heavy beating which led to the referee stopping the fight and declaring Kuga the 39th Japanese Super Bantamweight champion. Just 5 months later, he earned his first successful title defense over Ryoichi Tamura (8-2*) and his second on March of 2018 when he KOed Ryo Kosaka (16-3*) within 2 minutes into the match. Kuga is currently ranked amongst the top of the division by the WBA, the WBC and the WBO. Shingo Wake (24-5 / 16 KOs), not to be outdone by his upcoming opponent, has had quite a career thus far. Fighting close to 12 years, he has come face to face with some of the toughest boxers the Asian scene has to offer. In 2013, he locked horns with future IBF World champion Yukinori Oguni for the OPBF Super Bantamweight title. Oguni, undefeated at 10-0 at the time, was considered the massive favorite to win the scramble, having already defended the OPBF belt thrice against Hiromasa Ohashi (24-10*), Masaaki Serie (21-4*) and Roli Gasca (19-3*). Wake came determined and put on a clinic for 10 rounds, even knocking the champ down in the second. Oguni was rendered unable to continue and Wake won his first major title in the process. After earning 5 title defenses from 2013 to 2015, all finishes, he decisioned former IBF Asian champion Pipat Chaiporn (35-7*) in a World title eliminator bout. When the time came, Wake was overwhelmed by Jonathan Guzman’s (21-0*) power and got dropped numerous times throughout the match, suffering his only KO loss today. Despite coming short on his big opportunity, he displayed his fighting spirit by never surrendering and even giving Guzman some trouble, which made him more popular with the Japanese fans. Since then, he has been on a 4 fight winning streak, all KOs, including victories over Mikihito Seto (34-14) as well as former WBC International Silver champion and World title contender Boonsom Yamsiri (50-3). Both fighters are looking to take that next step in their careers. For Kuga, it’s a chance to finally break in the World title picture whereas for Wake it’s time to step back up and regain his place amongst the top contenders. Prediction: This is a pretty even fight. Kuga is 27 years old with a 58% KO ratio, while Wake is 31 with a 52% KO ratio. However, with 31 bouts under his belt, the experience factor definitely lies with Wake. At the same time, Kuga has never been stopped in his 19 fights, unlike Wake. Comparing recent performances, Kuga has faced better competition overall. Moreover, under the notion of “you are as good as your last fight”, Kuga finished Ryo Kosaka within the first round while Wake needed 4 rounds to put down a relatively inferior opponent in Roman Canto. All in all, Kuga maybe winning this on paper but you can never count out a veteran the caliber of Wake. The Super Bantamweight division has frustrated us immensely over the last few years on the international stage with a lot of fighters failing to meet chase the biggest and best fights available to them. Sadly what we've seen is champions regularly defending against sub-quality competition and this served as bit of a bottle neck at the top of the division with several interesting fighters now lining for an opportunity. One of those fighters waiting for a shot at the big time is Japan's Shingo Wake (17-4-2, 10), the current OPBF champion and a man who is ranked by all 4 major title bodies. At the end of February we see Wake back in the ring as he attempts to record the 5th defence of the OPBF title and take another step towards getting a long awaited world title shot. The man trying to destroy Wake's dreams is Filipino fighter Jimmy Paypa (16-2-1, 6), a man who was actually supposed to fight wake at the end of 2014. Wake's road to where he is has been a relatively long one. For the first 6 years of his career he toiling some what and compiled a relatively disappointing record of 12-4-2 (5). Up to that point his most notable win was a decision over Jonathan Baat and he wasn't expected to achieve what his team had once hoped. Suddenly in 2013 however things began to click for Wake who upset Yukinori Oguni to claim the OPBF title and since then he has been on a role with 4 successive defenses, all by stoppage, with the most recent of those coming against Jaesung Lee in July of last year. Wake's development was unforeseen by many though has seen him become better and better as he's become more confident and shown more belief in both his skills and his power. In fact it's the development of Wake's power which has been key with the fighter stopping his last 5 opponents, the same amount that he had stopped in his first 18 bouts as a professional. For those who haven't seen the champion in action he is a talented sharpshooter and although his power has improved he is still slippery and sharp fighter capable of throwing both power shots and flicky combinations with out telegraphing. More frustratingly for opponents he does it from the southpaw stance which makes him even more tricky than he would be anyway. Although we've followed Wake for a while the same cannot be said of Paypa who is, at just 21 years old, a very promising young fighter himself. In fact in the eyes of those who have seen him he should be undefeated with both of his career defeats coming very early and controversially. Sadly for those of us who didn't get to see him live the footage of Paypa is limited with much of it coming from very early in his career. Since starting 2-2 in his career Paypa has run up 15 bouts with out a loss. Those 15 bouts, including a technical draw, haven't come against the best but they do include a very impressive stoppage victory over the teak tough Eric Barcelona as well as decisions over Marvin Tampus and the then promising Jason Redondo. Sadly however there are negatives to take from Payapa's form. Notably he has been fighting at a very low level leaving us to be unsure how good he is. Second he has been dropped twice in his last 5 bouts with both Cristian Abila and Gadwin Tubigon dropping Paypa early in fights before he fought back to beat them. He was also, sadly, limited to a technical draw against Tsuyoshi Tameda in his only previous bout in Japan, last May. From watching early footage of a very young Paypa it's clear he had a lot of potential. He was sharp and looked like a genuine diamond in the rough. Sadly however we haven't managed to track down much in terms of recent footage. To us it seems however that his competition says more about him than any footage could and his handlers know that this is a big step up. We suspect it will be too big of a step, however we think Paypa will be back in a few years time and possibly fighting at the OPBF level again in the future. We suspect that this isn't going to be Paypa's time isn't now and Wake will do to Paypa what he did with Oguni and show the different between a talented and promising “boy” and a developed, and highly skilled, “man”. Like Oguni however we expect Paypa to take his loss well and to develop into a much better fighter down the line. On July 18th Japanese fans get treat to a national title fight at Super Bantamweight between defending champion Hidenori Otake and domestic challenger Daisuke Furuhashi. For us Otake is the second best Super Bantamweight in Japan behind OPBF champion Shingo Wake (16-4-2, 9), a man we rate very highly. Wake returns to the ring just days after the Otake/Furuhashi fight and defends his OPBF title against the #1 ranked OPBF challenger Jaesung Lee (17-3-2, 9) from South Korea. Like Otake, Wake is world ranked and is looking towards a world title fight, though will know that he needs a win, and better yet an impressive one, if he is to make that next step get a fight for world honours either at the end of this year or early next year. Wake is a fighter we are huge fans of and despite his record he appears to be a genuinely class fighter who is combining his fantastic skills with experience and maturity. In fact in many ways he's a big like Hozumi Hasegawa, as far out as that sounds, who suffered early losses then developed into a sensational fighter. Wake lost 3 of his first 10 bouts though has gone 10-1-1 in his last 12 contests whilst moving through the rankings and becoming a real force. The first sign of Wake's potential was shown back in 2011 though he began finding his groove last year when he shocked the previously unbeaten Yukinori Oguni to claim the OPBF belt. Since then he has scored a trio of title defences, all by stoppage, and looked like a fighter who has really grown in confidence and self belief. Although Wake has recorded 4 successive stoppages his real trait isn't his power but his frustrating trickery. Firstly he's a tall, rangy Super Bantamweight, add that to the fact he's a southpaw with quick reactions and sharp counter-punching and the fact he can take a shot without being troubled and you have a nightmare to fight. Sure he picked up losses early in his career but in recent fights he has been busier, more accurate and hard hitting than he was early on and it's shown in his results and his ever growing reputation as a potential world champion in one of boxing's more loaded divisions. In the Korean challenger we have a man who will be determined to launch himself on to the world stage. 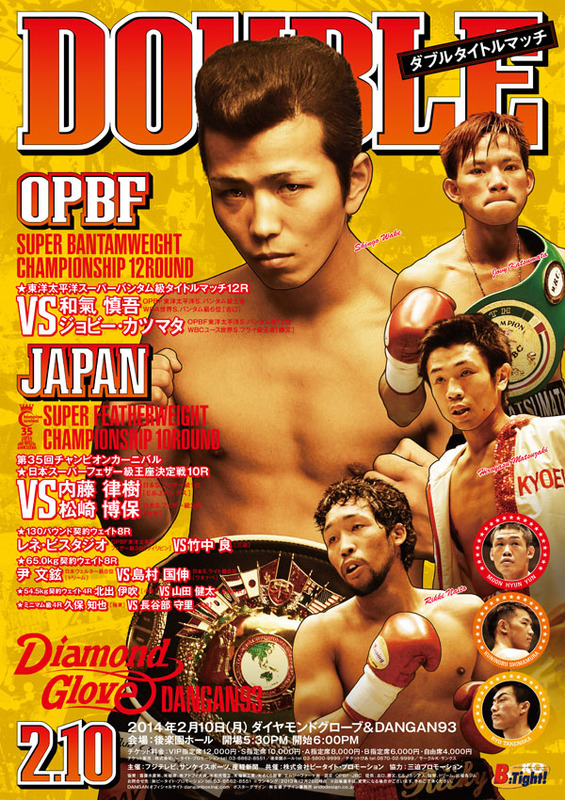 Lee not only has a chance to claim an OPBF title here but also put himself immediately into the world title mix. That's a huge opportunity for a man who is one of the few active South Koreans to actually look like he's got something about him. Lee is a fighter who, like Wake, suffered losses relatively early in his career. In fact Lee began his career 10-3-1 before going 7-0-1 in his last 8 bouts which have included wins over a number of Wake's compatriots, including Akihiro Matsumoto, Seigo Sato and Takuya Watanabe. Rather interestingly Lee is 3-0 (1) in Japan and is 4-0-1 (1) again Japanese opponents, a very impressive record for a South Korean right now. Further to that is that all 3 of Lee's losses have come in the US to Jesus Salvador Perez, Jorge Diaz and, most notably, world champion Mikey Garcia. From what we've seen of Lee he has a lot of traits one has come to expect of Korean fighters. He's brave, he takes a good shot, despite having 2 stoppages on his record, and he's happy to take one if he's going to land one in return. Of course like many Korean's his defence isn't a strong point though he certainly looks after himself better than, for example, Ji Hoon Kim who fights like defence is a dirty word. One thing we did find very misleading about about his record is that on paper he's not a puncher, in reality it does look like he has some real sting in his right hand, he's not a concussive puncher obviously but he looks like a solid puncher. Whilst we do enjoy watching Lee, and his fight with Watanabe from earlier this year was an amazing blood bath, we really don't see him posing any threat to Wake who we expect will be too sharp, too skilled, too fast and too good for Lee. Lee is what he is, an entertaining but crude action fighter unfortunately for him we don't see any way in which he can trouble Wake who is an exceptional sharp shooter. Hopefully however Lee will be invited back to Japan for a better stylistic match up for his next fight as he's someone who is made for TV. As for Wake we think a win here will be followed by either a world title fight in early 2014 or a world title eliminator. Hopefully he'll get a major bout that is given international exposure so a fight with someone like Leo Santa Cruz, Carl Frampton or Scott Quigg would be really top of our list for Wake for next year. If one Japanese fighter impressed us last year, without getting major acclaim, it was the sharp shooting Shingo Wake (15-4-2, 8) who really came in to his own. Wake, a relative unknown prior to last year, began to live up to his promise in 2013 and also claimed the OPBF Super Bantamweight title in the process as he moved from Japanese domestic class to fringe world class. The talented Wake, who kicked off his 2013 with an upset stoppage over the previously unbeaten Yukinori Oguni, went 3-0 (3) in the year. This was his year, the year that saw him believing in his talent and putting a few forgettable years well and truly behind him. Despite the success of 2013 Wake will be hoping to keep his career momentum going when he returns for his first bout of 2014, a bout that sees him defending his OPBF title against Japanese based Filipino challenger Jovylito Aligarbes (10-2, 4) on February 10th at "Dangan 93". Although on paper Wake will be the favourite, Wake himself will know all too well that being the under-dog can be a blessing in disguise. Of course Wake's biggest win was the victory over Oguni, an upset that wasn't foreseen by many. At the time Oguni was 10-0 (2) and world ranked, Wake was a distinctly average looking 12-4-2 (5). It's fair to say that Wake was in the situation Aligarbes is in now, a man looking to score their break out victory. For Wake though he'll not be wanting to through away what he has accomplished over the last 12 months, especially not to a fighter like Aligarbes. Wake, at his very best, is a nightmare to fight. He's slippery, he's fast, he's accurate and most frustratingly is the fact he lures opponents in time and time again before countering with a sharp straight shot. He's just as frustrating as he is talented and if he doesn't beat you physically with his sharp accurate shots he beats you mentally by making you chase shadows and tag the air. What makes Wake even more frustrating to fight is that he's a southpaw and a tall for the weight at 5'8". At his worst though, Wake can be very disappointing, lazy and lacking the fire to really be a star. Thankfully however Wake did seem to find his fire in 2013 and hopefully that will continue in to 2014. Aligarbes, also known as Jovy Katsumata, is a fighter who as just 19 years old is improving and is clearly talented. Unfortunately for the youngster he's still a long way from beating the likes of Wake. From his career so far Aligarbes has shown some genuine class, though he's also making a lot of mistakes still. He's a typical diamond in the rough that we often see with promising Filipino fighters. Unfortunately he suffers from one of the other problems of being a talented young Filipino, he's being matched in an harsh and unfair manner. Sometimes it works, as it did when Aligarbes took on Monico Laurente, but there is a big difference between the likes of Laurente and Wake. Added to Aligarbes problems regarding his unpolished skills is the fact he's moving up in weight. Aligarbes is the WBC Youth Super Flyweight champion and moving up to Super Bantamweight to take on Wake just seems like a ridiculously tough step up in terms of weight and class. Of course a loss to Wake isn't the end of the world but he certainly doesn't need another loss. Aligarbes should be given more fights in his division at his level than taking this big step up. We're expecting Aligarbes to start confidently and try and get to Wake but Wake's movement and accuracy will make him pay. By round 3 or 4 Aligarbes will be getting broken down and whilst we expect him to go out on his shield he'll never really be in the bout. Hopefully, for Wake, this will be his final bout against a lesser foe before moving on. He can, by all means, continue defending his OPBF title though he should only really continue defending it if he can get someone like Hidenori Otake, Genesis Servania or Albert Pagara in the ring with him. No one else in the OPBF Super Bantamweight rankings deserve to be in the ring with him and none of the other others would even give Wake a competitive bout.